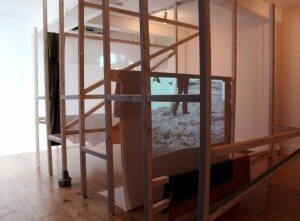 On for two more weeks – Indefinable Cities at Airspace Gallery, Stoke on Trent, reviewed by Dominika Mackiewicz here. More about the exhibition itself here. Build-up, a work originally made with the support of Castlefield Gallery for my exhibition there with Hayley Newman in 2013, has been purchased by the Arts Council Collection. 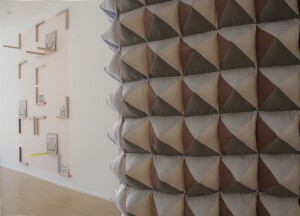 This new installation work is a commission from Plymouth Arts Centre and it opens tonight! The exhibition is on until 25th May so do pop in if you’re in the area. “In thinking about proxemics and repetitive behaviour Speed began this piece of work by visiting the south Devon coastline. Observing beaches as a site of constant change and regeneration, she related this back to human efforts at building and creating territory; forming an idea for a filmed performance at South Milton Sands (also known as Thurlestone Sands). A massive thank you to Gillespie Yunnie Architects for their sponsorship. 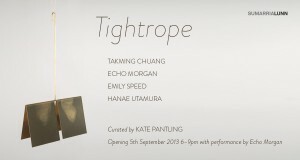 Curated by Kate Pantling, Tightrope brings together the work of four international emerging artists Takming Chuang, Echo Morgan, Emily Speed and Hanae Utamura. The artists share a performative approach to their practice, where a sense of harmony, dissonance and a raw energy are connecting threads. Each artist takes their own body as a starting point, orchestrating narratives that explore the impact of encounters with materials, environments and cultures. Their work is personal, particular and often intimate but speaks to broader political and cultural concerns. By approaching their work from the context of performance, the artists bring a strong sense of dramatic tension to their artworks. Each of them embraces the visual impact of their interventions to create work that encapsulates a moment imbued with anticipation. They create projects that play across multiple mediums eluding easy categorisation and bringing dynamism and depth to the expression of their ideas. The Transmitters by Serena Korda, HD video still, courtesy of the artist. ‘I Like The Way You Move’ is an evening of film and performance featuring – Romany Dear, Andrew Gannon, Candice Jacobs, Serena Korda, Jen Liu, Lucy Pawlak and Catherine Payton. They are all BRILLIANT. Murphy and Speed have selected the programme after ongoing conversations about their shared excitement when melodrama, slapstick, dance, hysteria and glamour are integrated into contemporary practice.